When I first saw this bird it was known as a blue grouse. In 2006 DNA evidence showed that two separate species comprised what was then called a blue grouse. The American Ornithologist’s Union separated Dendragapus obscurus (blue grouse) into sooty grouse (D. fuliginosus) and dusky grouse (D. obscurus). Dusky grouse are more of an inland species found in the Rockies while sooty grouse extend from Southeastern Alaska to Northern California between the coast as the Western Rockies. The sooty grouse is darker than the dusky grouse and there are differences in their calls. The sooty grouse is non-migratory. During the breeding season they inhabit openings in and the edges of conifer forests that have an understory of grasses and shrubs. During the winter the sooty grouse moves into dense conifer stands, usually at a higher elevation than their breeding grounds. In the winter sooty grouse sit in conifer trees and eat mostly conifer needles. At other times of the year they forage on the ground eating leaves, flowers, buds, berries and some insects in addition to conifer needles. Young sooty grouse eat more insects than the adults and eventually become primarily vegetarian as adults. In some areas of their range sooty grouse are declining in numbers, particularly in the south of their range. (As upland game birds there are hunting seasons for sooty grouse.) Leonard and I do not see sooty grouse often – not for lack of effort. 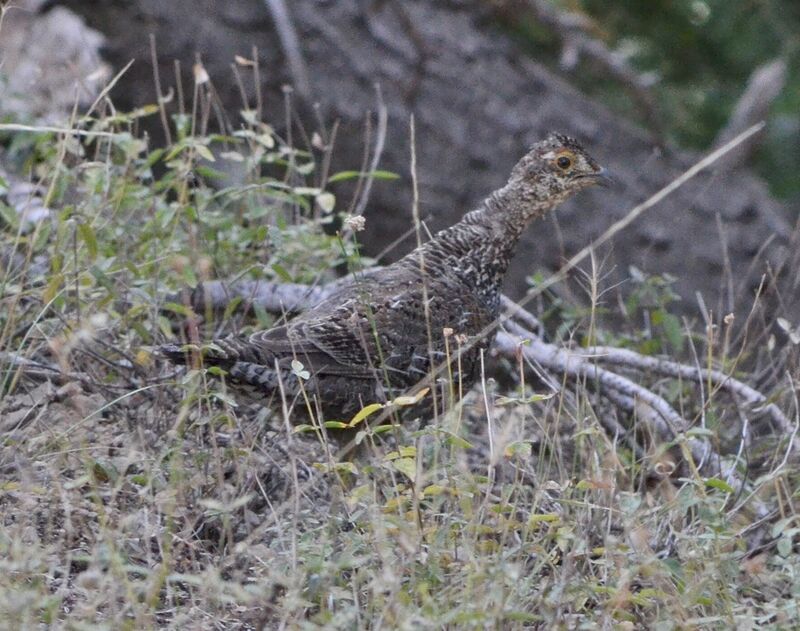 This sooty grouse was at about 7,000′ elevation in the Medicine Lake Highlands of Northern California. Sooty grouse are usually found singly, the exception being a hen with her young. This grouse was one of a pair – both similar looking. My first thought was that the pictured bird was a female. But it might be a juvenile since juvenile sooty grouse are similar to females. No matter, female or juvenile, Leonard and I were excited to see a sooty grouse. This entry was posted in Birds and tagged blue grouse, Dendragapus fuliginosus, Dendragapus obscurus, dusky grouse, nature photography, sooty grouse. Bookmark the permalink.